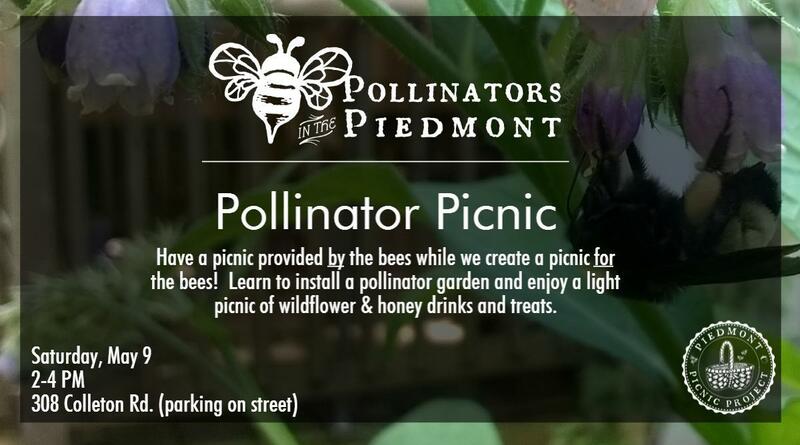 Piedmont Picnic Project hosted our Pollinator Picnic this past Saturday as part of the Second Saturday events in Raleigh and as part of our Pollinators in the Piedmont blog series! Special thanks to all those who came out for the event! See full gallery here. Special thanks to Papa Spuds for providing all of the honey for the event! If you’re interested in Papa Spuds local foods delivery service, they’ll waive your enrollment fee and give you $5 off your first order when you use the coupon code PICNIC. A full bee buffet of honey and wildflower drinks and treats, including Honeygirl Meadery mead and Brothers Vilgalys Spirits krupnikas cocktail! #yogurtcheese flavored with #honey and #foraged #hickorynuts decorated with more nuts, #nativehoneysuckle and #wildroses at the #PollinatorPicnic! A pollinator garden demo including a good dose of bee history and recommendations for pollinator plants. This berm is stuffed full of BREW coffee grounds and compost from a kindly CompostNow customer! Stay tuned to our Pollinators in the Piedmont series to see what’s next – like our upcoming Wild History walking tour – learning more about pollinators, bee history, and forageable wildflowers!